The information on driving, chipping and putting seems endless, but what about information about going from driving to chipping or putting? In this piece of course management, Troy Klongerbo talks about the importance of understanding your distances on your mid irons, as well as how to manipulate your typical distances to help you shave strokes off your round in no time. Hey golfers, Troy Klongerbo here with USGolfTV, and today we’re going to talk about course management. Now a lot of instruction has been put out about how to hit drivers better, how to putt better, how to chip better, bunker play; but not too much attention is really focused to your mid irons, and really how to optimize those shots in your golf game. So today we’re going to spend some time talking about those. Now for most golfers, they’re going to have anywhere from a 3 iron to a 4 iron all the way down to a pitching wedge, and that leaves us with about 7 or 8 golf clubs that we consider your irons. Now when controlling your distances, you may have upwards of 14 to 15 clubs that you consider irons based on just the way you grip the golf club. You know, most irons are going to have a 10 yard increment between them, 10 to 12 yards. Now you can cut that in half just by controlling where you grip the club on the golf club. Choking down a little bit—maybe a little closer to the steel—that would be critical for understanding that you could take 5 yards maybe off an iron shot. Now you’re really filling those intervals in, and giving yourself a ton of different options when you’re on the course. So that’s the first big step, is understanding how far you’re hitting the golf ball. What plays into that is the lie you have when you’re playing. If you’re playing out of the rough, you might catch different lies based on whether it’s sitting up or sitting down. When you’re playing from the fairway, you may get a tight lie, or a lie that’s sitting in a divot, and all of those factors play in. It’s very important to understand how the lie interacts with the shot that you’re trying to hit. So when you guys are out there practicing, I really challenge you to go out there and work on different distances. 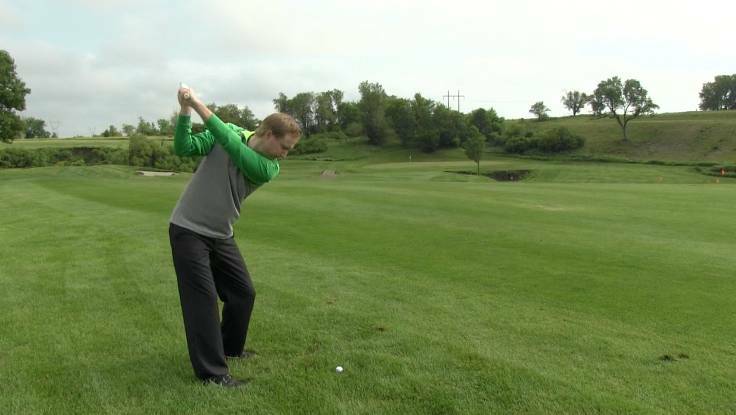 Choke up on the club, grip one normal; see how far those golf balls fly. Maybe hit one out of the divot and see, “am I losing some distance here, or is this ball flying the way it normally does?” Maybe even take some out of the rough on the side of the driving range, hit some of those; tee a couple up and set a couple down. Understand that you’re losing ten yards on some shots, 15 yards; you might be picking up 5 yards here, and it’s all about understanding your game better so you can manage the course better and shoot better golf scores.